One of the main goals of the AR project is the social inclusion of people with intellectual disabilities (ID). Using radio production for this purpose has not been widely studied. As with all people with a disability, representation of people with intellectual disabilities is scant in the mainstream media. While people with an intellectual disability 2.9% of the Australian population (ABS 2012), this is a substantial minority and one that is growing. This minority is largely unheard in the mainstream media, rather they are spoken for by parents, carers, lawyers, the police or documentary makers, rarely in their own voice. Sadly, they are often represented as stereotypes, as victims or in a patronising way that does not recognise their human rights. The Australian public may gain no experience or insight into the life of such people without personal experience, given this dearth of representation. Thus many people with ID quietly go about their lives without attention drawn to their common struggles, which can be many: some of the highest rates of exploitation, abuse and sexual assault in any group; difficulty making friends and feeling a meaningful part of society; the poverty of life on the Disability Support Pension and unemployment; and prejudice and ignorance of their actual capacities. The fact is many people with ID live relatively independent lives where they can and do make their own decisions and choices and want to engage in useful work and contribute to the world. Like anyone else, people with ID have talents, a sense of humour and the same wants and needs that all of us possess. In my experience of work with people with ID, there is a great need to be heard – to tell one’s story in one’s own voice. And this is not easy given many people from this group have spent their lives in institutions where behaving, agreeing and complying with authority are expected. Learning to use your own voice is a challenge too. Community radio in Australia was founded on the notion that everyone should be able to participate in the social, cultural and political life of the nation. It has done so admirably with regard to CALD communities, LBGT communities and indigenous groups and has played a part in enhancing their rights and empowerment. It has not been so successful with regards to disability, with just a handful of stations airing programs that give voice by people with disabilities. 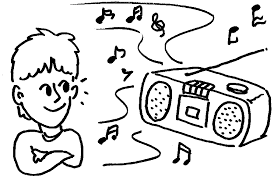 Yet in the digital age radio is an inexpensive, accessible and relatively easy medium to learn. Thus the project has joint goals of enhancing the social inclusion and empowerment of people with intellectual disabilities in Brisbane, and enhancing the capacity of community radio to embrace this minority group as capable and motivated learners and makers of meaning. And in 1971 students in Brisbane were so concerned about biased and indifferent media coverage of the Springbok tour that they contemplated setting up a pirate station too. This group ultimately went on to form 4ZZZ. Jim Beatson currently working at the CBAA was intimately involved with the creation of 4ZZZ. (Langdon 1995). Having a voice has long been recognised as a vital to human and democratic rights. Community radio stations “provide a voice for communities to address issues relevant to their local areas and their lives” (Australian Government 2010). We understand that addressing the complex barriers to inclusion won’t be solved by one simple radio production course. However, being involved in co-production, where one’s voice is equal to all others, where it is safe to speak your mind, and were everyone’s contribution is valued, can help sow the seeds of the self-confidence and self-belief needed to speak out on the things that matter. Social inclusion is an important challenge for people with learning and intellectual disabilities. Education provides an opportunity to enhance people’s sense of their own capacity, valuing their experiences and increasing their skills in a group setting where friendship and social support can occur. Empowering people to make decisions and take part in the social and political community is arguably an important goal of education. People with cognitive difficulties have the same democratic rights as all other Australians, and like all of us, take an interest in the public life of our nation. Having a voice is vital to democracy, as much as it is to individual self-esteem. These are some of the ideas we will be exploring in this radio project. Grimes, M. & Stevenson, S. (2011). Radio as a tool for rehabilitation and social inclusion. Ch 12 in Mollgard, M (2012). Radio and Society: New thinking for an old medium. Cambridge: Newcastle on Thyne. Kemmis, S. & Wilkinson, M. (1998). Participatory action research and the study of practice. Action research in practice: partnerships for social justice in education. B. K. Atweh, S. & Weeks, P. London, Routledge. Lewis, P.M. and S. Jones (eds.) (2006) From the Margins to the Cutting Edge: Community Media and Empowerment, New Jersey: Hampton Press. United Nations General Assembly (24 January, 2007). Convention on the Rights of Persons with Disabilities: resolution / adopted by the General Assembly. A/RES/61/106.